Celtik Wall Straight Capping Unit & Radian Caps. Celtik walls cap stones were designed to complement the textures and rich blended colors of our paving stone collection. Contact us today at Orlando Outdoors! The gently distressed surface and antiqued edges whisper quiet sophistication. Smaller than Bergerac and featuring a wide array of shapes, Dublin Cobble creates a casually elegant, time-worn look recalling the hand-laid stone of centuries-old Mediterranean villas. Contact ustoday at Orlando Outdoors! The use of concrete pavers, often referred to as paving stones, is growing rapidly on both commercial and residential construction projects. 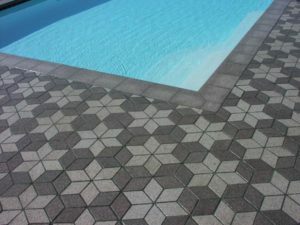 Interlocking pavers form a patterned surface which can be put into service immediately. Pavers are manufactured in various textures and colors. A big benefit of pavers is that they can be removed and re-installed, which reduces future service interruptions. The use of concrete pavers is expanding rapidly. There is plenty of growth to go: in Europe there are 100 square feet of pavers installed per person annually whereas, in the United States it is only 1 square foot per person. Pavers can be installed on your driveway, on a walkway, and on a patio. Pavers come in a variety of patterns, colors and styles to suit most any design idea.